Hand-drawn; hand-colored; hand-lettered. 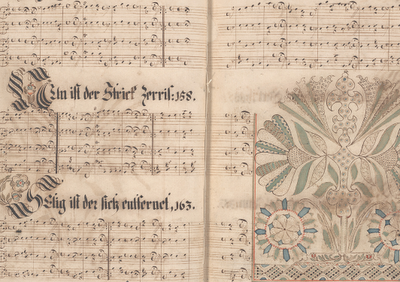 This fraktur consists is leaf 18 (verso of 18/recto of 19) in a music book that was produced at Ephrata Cloister. On the left are the opening lines of three hymns with music. On the right are music and a drawing of flowers. The book consists of three preliminary leaves, one hundred and forty-one numbered leaves (out of an original one hundred and sixty), one unnumbered leaf, and the printed index of opening lines of the hymns in four unnumbered leaves. 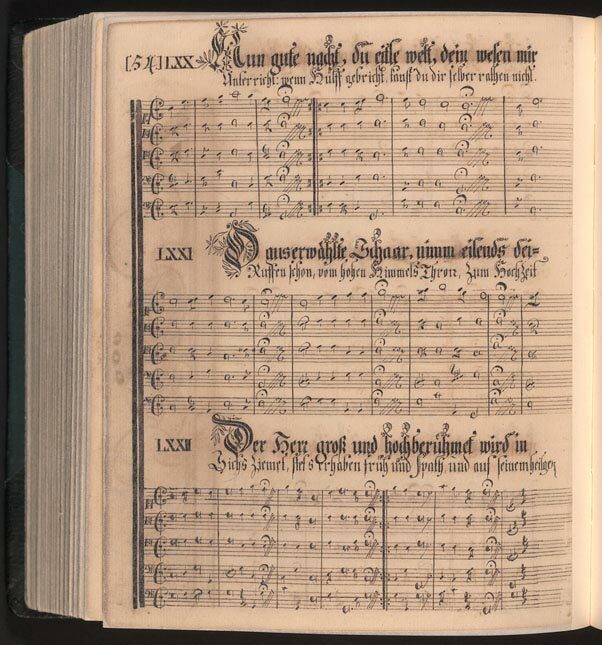 The music includes music in four parts and the opening words to a selection of hymns from the Zionitischer Weyrauchs Hügel (The Incense Hill of Zion), published in 1739 by Christoph Saur of Germantown. There is major decoration on the rectos of leaves numbered 19, 24, 30, 38, 58, 61, 88, 90 and 122. Minor decorations can be found throughout the book. Three additional leaves, including verso of 60/recto of 61, verso of 89/recto of 90 and verso of 120/recto of 121, are included in the database as FLP 114702, 114703 and 114704. Courtesy of the Free Library of Philadelphia. Was doing some research on Conrad Beissel, the founder of the Ephrata Community (a lodestone in my understanding of a particular driver/style setter in the Fraktur style). Beissel came to the US from Germany as part of the Community of the Brethren--and split off to found Ephrata, a monastic community with a sisterhood and brotherhood. Beissel wrote hymns and encouraged his followers to sing, and sing purely--as their celibacy, they believed, was manifested in the purity of their voices. Chasing down a bit on Beissel's hymns, there was a firestorm of hymn writing in Pennsylvania at that time happening in all corners of the state from the Ephrata Community to the Moravians in Bethlehem (see the Google book, The Early Hymn Writers of Pennsylvania by Lucy Carroll. Coupled with this writing, Beissel encouraged his followers to illuminate and illustrate hymnals which went beyond the walls. 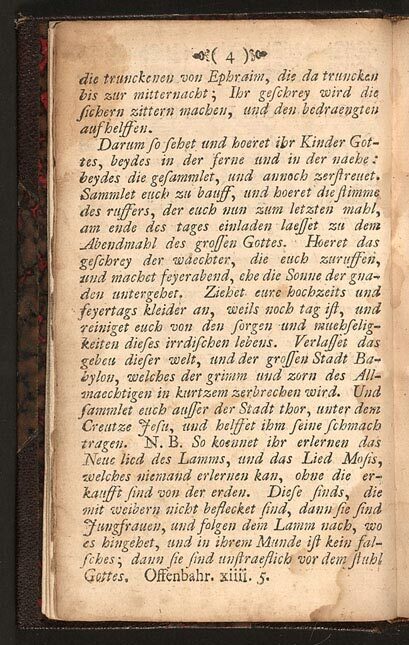 * Mystische Und sehr geheyme Sprueche (Mystical and Very Secret Sayings) (1730) --- Authored by Conrad Beissel to explain his other-worldy views on Christianity, celibacy, and spiritual androgyny. 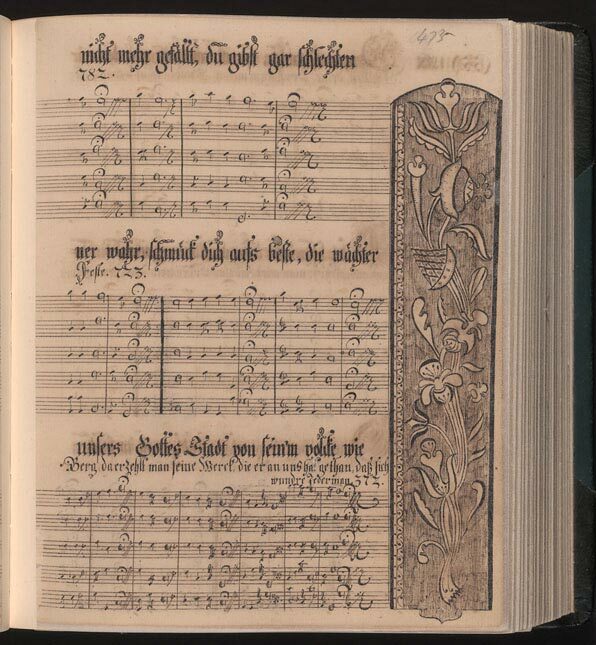 * Goettliche Liebes und Lobes gethoene Welche (1730) (Melodies of Love and Praise) --- This is a hymnbook of 65 hymns written by Conrad Beissel and other Cloister poets. * Vorspiel de Neuen-Welt (1732) (Prelude to the New World) --- This is sort-of Beissel's New World Symphony. It's a hymnbook, with more mystical hymns by Beissel and friends. "Founder of the German Seventh-Day Baptists Johann Conrad Beissel immigrated with the community to Ephrata, Pennsylvania, in 1732. Beissel served as the spiritual director of the group as well as its composer, devising his own system of composition. The group's illuminated musical manuscripts were hand-lettered in Fraktur and are among the earliest original music composed in the British colonies. This illustrated hymnal was once in the possession of Benjamin Franklin. The rare second compilation of Beissel's hymns was printed in roman type without music by Benjamin Franklin in 1732."